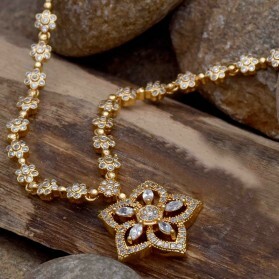 This imitation White stone studded temple jewelry Ear chain connects the side hair and the earring and covers your ear. This matti can also be used for Mohiniyattam, Kuchipudi and Bharatanatyam dances. This is also known as kaan chain, Matti or Mattal. Sold in pairs. 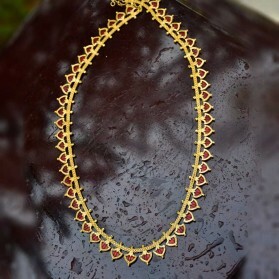 This imitation Red and White stone studded Temple jewelry Ear chain connects the side hair and the earring and covers your ear. This matti can also be used for Mohiniyattam, Kuchipudi and Bharatanatyam dances. 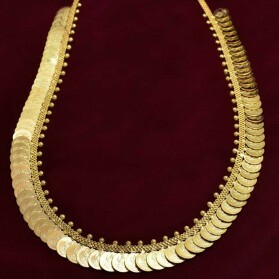 This is also known as kaan chain, Matti or Mattal. Sold in pairs. 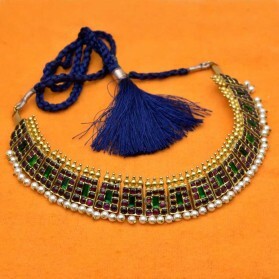 This Imitation Blue and White stone studded Temple jewelry Ear chain connects the side hair and the earring and covers your ear. This matti can also be used for Mohiniyattam, Kuchipudi and Bharatanatyam dances. This is also known ans kaan chain, Matti or Mattal. Sold in pairs. 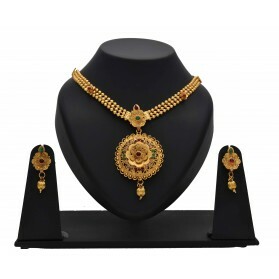 This high-quality gold-plated Kemp and Green stones and pearls studded Temple jewelry model Ear chain connects the side hair and the earring and covers your ear. This matti can be used for Mohiniyattam, Kuchipudi and Bharatanatyam dances. 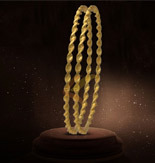 This is also known as Kaan chain, Matti or Mattal. Sold in pairs. This original Temple jewellery Kemp and Whitestone broad Ear Chain connects the side hair and the earring and covers your ear. This matti can be used for Mohiniyattam, Kuchipudi and Bharatanatyam dances. This is also known as Kaan chain, Matti or Mattal. Sold in pairs.